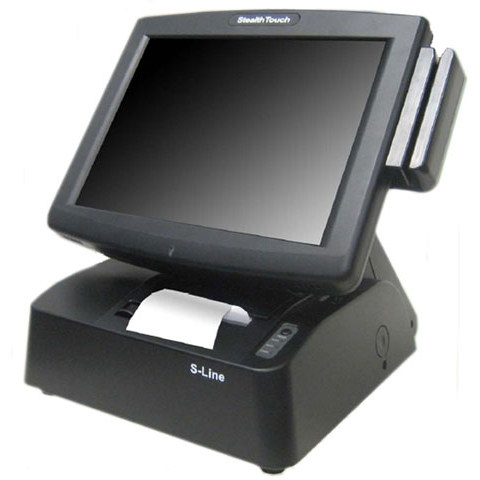 The S-Line redefines the all-in-one design by integrating an EPSON thermal receipt printer into a touchcomputer. Its compact design allows easy setup (watch video), and will save precious counter space, reduce cable clutter, last but not least, generate additional revenue. The S-Line has a bright 17" display, and is powered by Intel's Atom, up to Core 2 Duo processor. It runs most Windows operating systems, and offers a wide range of integrated peripherals, such as magnetic stripe reader, biometric reader, barcode scanner, and secondary display. Expandability includes Intel Gigabit network, 4 Serials, 6 USB, poweredUSB +12V and +24V. Mag. Stripe Reader, 3Tks, Usb, 17" Model. - Mag. Stripe Reader, 3Tks, Usb, 17" Model. 8" Lcd With Bracket. - 8" Lcd With Bracket. Omni Barcode Scanner, Usb. - Omni Barcode Scanner, Usb.